The Cambridge Hotel has a long history in a fascinating part of Sydney with its own colourful past. Today, this is more of a boutique hotel with a selection of rooms and suites. A notable part of its history is that the hotel’s restaurant was the first to bring French-style dining to Sydney. It became a magnet with the rich, the famous and the notorious! Today, the restaurant is undergoing a refurbishment. It will open as Café 212 on Riley in November 2012. With over ten awards since 2010, the hotel is also serious about being green. A Green Star Award for environmental good practice is evidence of this. Of course, the hotel has all the facilities and features you’d expect. So, there’s 24-hour reception and room service, as well as a tour booking desk. There is internet access available, wirelessly in places. A heated indoor pool and spa is on hand, plus a secure underground car park, whilst a shuttle will take you to and from the airport. If you are travelling on business, you’ll be well taken care of. A business centre and a choice of three conference rooms are properly-equipped and serviced for all types of seminars, training sessions, conventions and conferences. The Penthouse room on the 14th floor, with a great city view and balconies, can cater for up to 60 people. The Conference Rooms on the ground floor are larger, with enough space for up to 200. 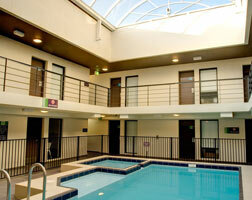 The rooms at the Cambridge have a modern design, whilst some have balconies to make the most of the sun. Some rooms have great views of the iconic Sydney Opera House too. For a real touch of luxury, book a Deluxe Spa Room, which includes a corner spa for two.